Thought I might as well mark National Poetry Day, as I do write it occasionally. You know when you're a kid and you get the wrong end of the stick about something you've only heard about in passing? And then you never get disabused of the idea? This is about when I realised the Elgin Marbles weren't big round rocks. Yeah, I was an idiot. And about 25. ‘Let’s be one of those couples’. 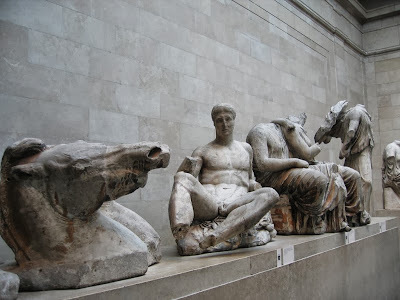 I’d wanted to see the Elgin Marbles. wasn’t the wonder in how smooth they are? supplicants crowded the walls. Oh. in my ears felt thicker. Hot. Words buzzed. Distorted, in swimming pool air. tongue lolling. Torsos missing only the gibbet. Exposed to time and air and public scrutiny. No Arcadian pursuit after all. Who’d have thought? We bought coffee and perched, high on stools.